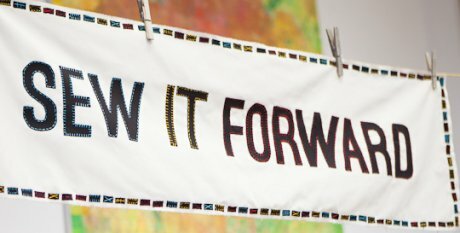 Sew It Forward is an initiative that we launched recently to encourage people to share their sewing, mending and knitting skills with their friends, family, neighbours, or anyone else who is keen to learn or willing to listen. It is about grabbing these skills while we can, before they are lost forever, and passing them on. To me, what is most exciting about Sew It Forward is that it's not only about learning to mend something old, or to make something new, it is also about acknowledging, and even celebrating, the process of making. It is about bringing our skills out from our sewing rooms, and sharing them with the world. We thought that, in keeping with the theme of Sew it Forward, and to celebrate the process of making, it was important to document the construction of the banner we made for our event at Henrietta Ludgate's studio. So here is a little 'how to' to get you in the mood of Sew It Forward. • To start this project, Zoe rummaged through her sewing box (unfortunately mine is back in Sydney) and found some black cotton off cuts, a piece of unbleached cotton - perfect for banner making - and a needle and thread, and sent me on my way. • The letters were cut from the cotton after they were backed with a fine layer of bondaweb and arranged on the backing fabric. • Each letter was ironed in place (using my housemate, Irene's iron and ironing board - it's about sharing tools as well as skills, plus an iron wouldn't fit in my backpack), before being stitched in place with coloured embroidery thread. This made a feature of each stitch and accentuated the handmade look of the banner. • The last, and most time consuming part of this project, was adding the 'stitches' around the edge. A small rectangle of black cotton was cut, ironed in place and then stitched along each side, to present each individual stitch. Although it took a long time, it was worth it. This feature really completed the banner, and also gave me a chance to sit down and get to know my new housemates. Sometimes we get carried away, thinking that everything we do needs to be done as quickly as possible. What's nice about hand sewing, knitting and mending, is that it forces you to slow down; to sit down, take a moment on your own, or take a moment with others, have a chat, maybe even have a cup of tea or a glass of wine, and watch the project slowly take shape. And there we have it, a beautifully finished banner ready for hanging! So in the theme of the initiative, we made a banner that used materials responsibly, we were resourceful, we shared tools, we were social, we took our time, and enjoyed the process of making, from beginning to end. Loving the idea of sewing it forward - nice job on the banner btw. Maybe the ultimate "sewing it forward" project is morsbags. There are full details on how to make them (and hints and tips) on the morsbags website and forum. * did I mention the cake? The bag was designed to be constructed using the most basic of tools and skills. If there is a gang of you and one or two people are sewing phobic then set it up assembly line style and have them on the cutting out or ironing station (or the cake station) - Henry Ford eat your heart out! Do it anywhere - my fave thing at the moment is sewing them al fresco (weather permitting) with a hand cranked Singer sewing machine. One little thing, they can be a tiny bit addictive - you were warned !